9 oz. ARC Perfection Stemless Wine Glasses. Personalized stemless wine glasses are not only chic and stylish but are the perfect addition to your glassware collection. Ideal for special events, restaurants, bars, hotels and more, these custom printed stemless wine glasses are manufactured with only the highest standard glass material, thus providing you with long lasting promotional tools that further help promote your brand. Ideal giveaway items, these can be presented at trade shows, conventions, corporate meetings and other events of the like. Enhance the look of your wholesale stemless wine glasses with an extra flare and add color to the base of the glass. 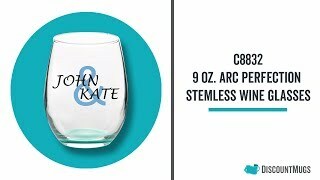 Order our bulk stemless wine glasses printed, etched or engraved, and add your brand name, logo, names and event dates; purchase blank and add striking candle holders to your events. Customizing your personalized stemless wine glasses is easy when you use our online interface and D-lab tools. Get started on your order today and select from our gallery of free clip art and fonts should you not have a logo of your own. Call us today, we are always glad to help. Delivered on time, None were broken (one had a crack but that might have been on me... oops), only complaint was they were a bit thin but other than that great cups! A perfect souvenir for my party! The glasses are beautiful! What a classy, easy solution for serving drinks without the mess of paper/plastic!